Sometimes, it’s rewarding and instructive to dwell on what might have been. 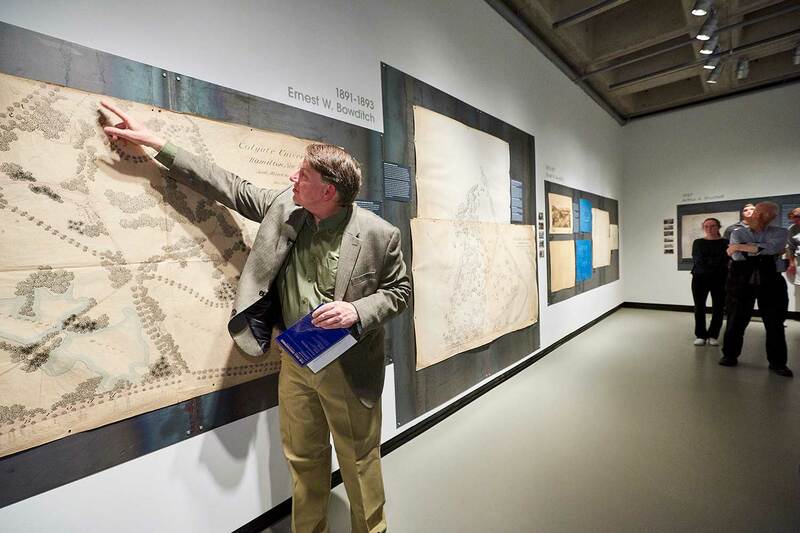 Art history professor Robert McVaugh and a series of students spent 10 years researching in the Buildings and Grounds Archives and the Colgate University Archives. 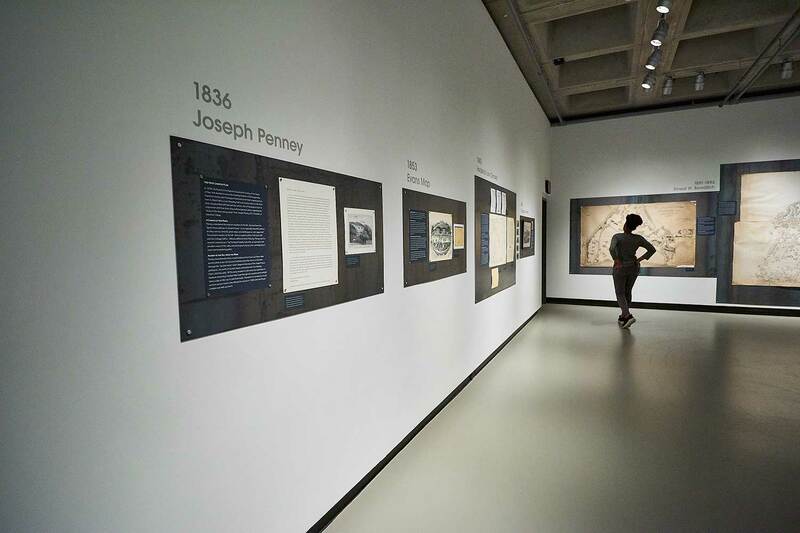 The result is an exhibition that combines thoughtful research and striking presentation, much of it organized by students Emily Crichlow ’18 (Edmonds, Wash.) and Allison Shahidi ’19 (Madison, N.J.). Through the years, various plans were created by a succession of well-known architects and campus planners, including Frederic Law Olmsted, the designer of New York’s Central Park, and Paul Rudolph, one of the leading architects of the Modernist era. Some of these plans were actualized and some were discarded, but all of them are part of Colgate’s history and helped shape the campus we know today. 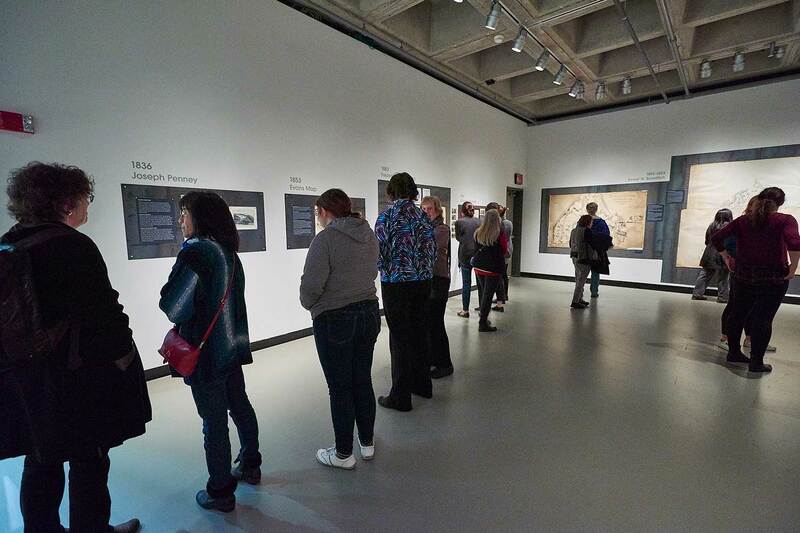 Upon entering the gallery, one is immediately struck by the beauty of the old drawings and sketches. 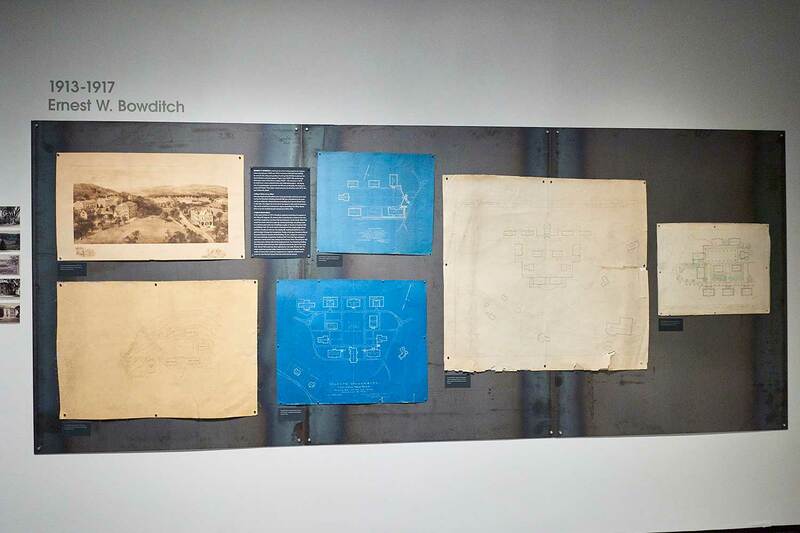 Large, thin sheets of steel are mounted to the walls and the plans are attached to the steel with magnets. McVaugh described it as “a show of possibilities.” Yellowed pages depict our singular surroundings in forms both familiar and strange. 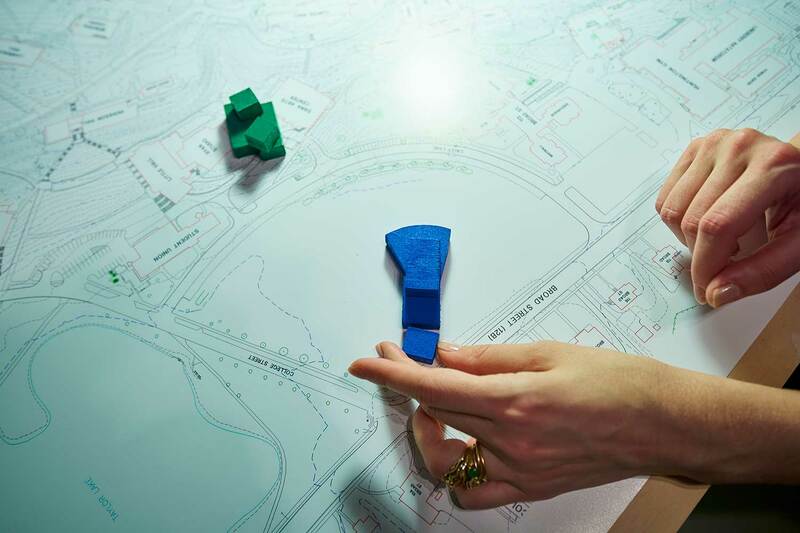 In an interactive display, visitors encounter a map of Colgate’s campus as it is today and then create their own version by placing models of potential buildings on the map. In the center of the room is a 3D model of the modern-day campus created by Crichlow. During the summer, a second 3D model will be created using a survey done in 1891 by E.W. Bowditch. In his gallery talk at the opening of the exhibition, McVaugh noted that it’s easy to imagine our surroundings as static. “It seems obvious that Colgate Memorial Chapel should occupy its commanding position on the western end of the academic quadrangle,” he said. Yet, until 1918, the academic quad itself did not exist — there were multiple plans drawn up, discussed, and discarded. The lowlands consisted mostly of bog and were difficult to navigate until the creation of the Taylor Lake dam in 1903. Original plans for the Dana Arts Center drawn by Paul Rudolph called for a stairway linking the roof sculpture court with the upper campus. 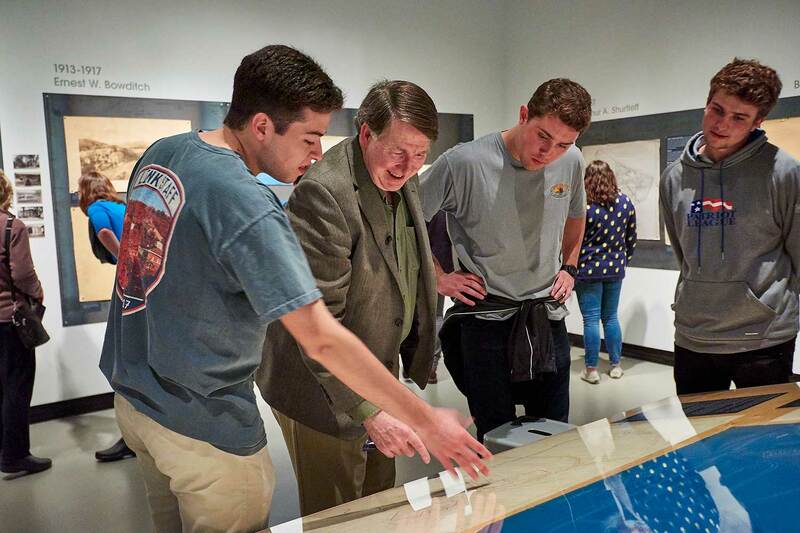 The exhibition illustrates the challenges faced by each generation of Colgate’s administration as they worked to integrate the upper and lower campus. The Hill Envisioned: What Might Have Been — What Might Yet Be is a Bicentennial event, sponsored by the Bicentennial Committee. It is open to the public, Monday through Friday from 10:30 a.m. to 4:30 p.m., Saturday and Sunday from 1:00 p.m. to 5:00 p.m. until June 3. The exhibition will reopen for the fall semester, August 31–October 3, and be featured in a panel during Founders Week, September 24–28.